There is little doubt that a series of EU Directives on money laundering and on public procurement have not reduced the incidence of financial crime in public contracts, in banking transactions, or in dealings among the ¿vulnerable¿ professions (mainly accountants, lawyers, and notaries). It is the convincingly argued thesis of this book that this failure stems directly from the dependence of these EU Directives on national laws criminal records. Harmonisation of these laws, the book demonstrates, is not only necessary but urgent. exchange of criminal record data in the framework of EU data protection legislation. Contents: List of Abbreviations. Preface; C. Stefanou, H. Xanthaki. 1. 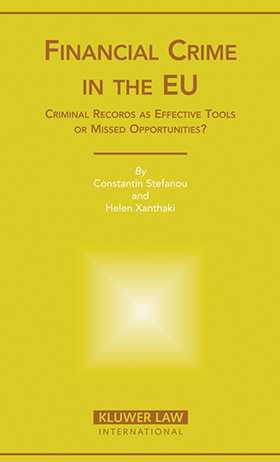 National Criminal Records as a Means of Combatting Organised Crime: Final Report; H. Xanthaki. 2. National Criminal Records and Organised Crime: A Comparative Analysis; H. Xanthaki. 3. National Criminal Records as a Means of Combatting Organised Crime: The Political Parameters; C. Stefanou. 4. Exchange of Information Included in the Criminal Records within the EU: Human Rights Considerations; A. Xanthaki. 5. Criminal Records and Organised Crime in Austria; R. Kert. 6. Criminal Records and Organised Crime in Belgium; J. Simon. 7. Criminal Records and Organised Crime in Denmark; K. Brant Hansen. 8. Criminal Records and Organised Crime in England and Wales; L. Webley. 9. Criminal Records and Organised Crime in Finland; K. Mäkelä. 10. Criminal Records and Organised Crime in France; F. Havard. 11. Criminal Records and Organised Crime in Germany; L. Boellinger. 12. Criminal Records and Organised Crime in Greece; O. Andritsou. 13. Criminal Records and Organised Crime in Italy; A. Di Nicola, B. Vettori. 14. Criminal Records and Organised Crime in the Netherlands; O. Jansen. 15. Criminal Records and Organised Crime in Spain; F. J. García Fernández. 16. Criminal Records and Organised Crime in Sweden; A. Kjellgren. 17. Criminal Records in the EU and the Protection of the Single Market: Possible Ways Forward for Cooperation; S. White. 18. Concluding Remarks; C. Stefanou, H. Xanthaki. Index.